The WHIZ Media Group has deep roots in Southeastern Ohio. Broadcasting on your radio dial since 1924 and on your TV since 1953, we know a few things about what matters most in our community. We’ve already helped thousands of local businesses share their message, let us help spread the word about yours with our digital platforms. -Become a member of our Business Directory to become easily searchable to potential customers. -Add your website to our featured links to highlight special events. -Highlight your business in three different banner ad designs on any page of our site. WHIZ celebrates decades of local coverage that’s more than just news; it’s the things happening at home. Call today and ask how to place your business on our website! 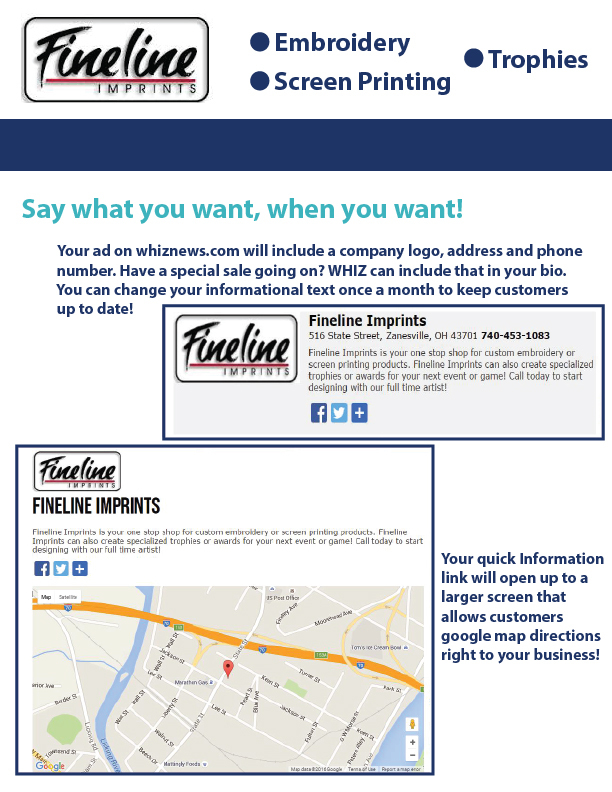 Businesses have the opportunity to include an address with a Google Maps image, a company logo, phone number, website link and paragraph that highlights your business features. Each listing is categorized according to business type so that users can find exactly what they are looking for. This gives our audience a centralized location of local businesses they are interested in, as well as gives your business the opportunity for more exposure. We are excited to share this opportunity with you! For less than $0.50 a day, your business can be listed on our website, which has more than 100,000 unique users! *An existing advertiser is any business that has advertised on any WHIZ Media Group platform within the past year. Featured Links allow us to highlight local businesses for their achievements and also advertise upcoming events in the community. To learn more about placing a Featured Link on whiznews.com, call us at the station. Web Advertisements allow our clients to quickly grab the attention of our web viewers (and their potential customers). We offer three different web ad sizes to choose from. We can even place your web ad on a specific page of our site. Give us a call today to discuss placing an ad on whiznews.com!